Introduction: Indian population consists of people from different cultural backgrounds, and there is a very strong influence of the various beliefs, myths, and misconceptions on health-seeking behavior in our population. Cultural, religious, social, personal habits, and practices cause disparities in oral and general health but also affect oral and general health. Aim: The aim of the study was to determine the prevalence of common beliefs about oral health, diseases, and treatment. Materials and Methods: A cross-sectional survey was conducted among randomly selected 1000 participants aged 18 years and above. 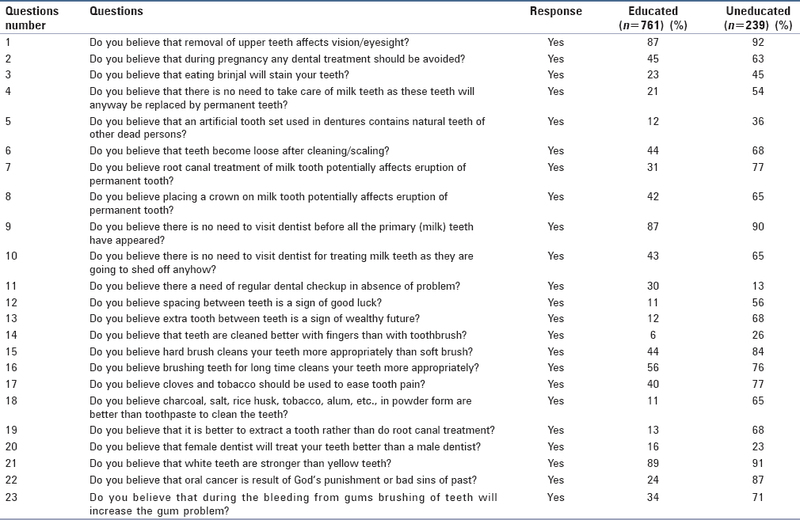 A self-designed questionnaire incorporating 23 questions about various common beliefs about oral health, diseases, and treatment was used for data collection. Results: Ninety-eight percent of the study population had at least one common belief about oral health, diseases, and treatment. Conclusion: The population under study showed high prevalence of beliefs about oral health, diseases, and treatment. This could be associated with delayed health-seeking behavior and poor compliance with treatment. Culture refers to the patterns of thought and behavior of people. It includes values, beliefs, rules of conduct, and patterns of social, political, and economic organization. These are passed on from one generation to the next by formal as well as informal processes. Culture consists of the ways in which we think and act as members of a society. Thus, all the achievements of group life are collectively called culture. Culture has two types: (i) material and (ii) nonmaterial. The first includes technologies, instruments, material goods, consumer goods, household design and architecture, modes of production, trade, commerce, welfare, and other social activities. The latter includes norms, values, beliefs, myths, legends, literature, ritual, art forms, and other intellectual literary activities. Lack of education along with traditional beliefs and sociocultural factors leads to the development of false perceptions and myths. Barriers to oral health care include illiteracy, financial constraints, cultural perceptions, lack of awareness, inequitable distribution of dental manpower, and inaccessibility to services. There has been little research to understand the beliefs related to oral health. Therefore, a study was conducted to find the prevalence of common beliefs about oral health, diseases, and treatment. A cross-sectional questionnaire-based study was conducted over a 2-month period at Sangamner, Maharashtra. Sangamner is a city and a municipal council located in the Ahmednagar District of Maharashtra state in India. There are around 172 villages in Sangamner taluka. Ten villages, namely, Digras, Ghulewadi, Kadlag, Jorve, Karule, Kasare, Samnapur, Sangamner Kd, Tisgoan, and Gunjalwadi, were selected based on simple random sampling technique and from each village, and around 50 participants >20 years who were cooperative and willing to participate in the study were selected randomly. The same method of simple random sampling technique was followed for participants living in Sangamner town. Five hundred participants between 18 and 60 years, who were educated, cooperative, and willing to participate in the study, were selected randomly. Ethical approval was obtained from the Ethical Committee of SMBT Dental College and Hospital, Sangamner, Maharashtra. Permission was obtained from Village Head (Sarpanch) from where the study participants were selected. Written informed consent (local language – Marathi) was obtained from participants who were willing to participate before the study commenced. A self-designed questionnaire incorporating 23 questions about various common beliefs about oral health, diseases, and treatment was first developed in English to facilitate its review by experts in dentistry for structure and content validity. The English version was then translated into a more viable local language (Marathi) to aid comprehension by the study population. These translations were done by language experts having some expertise in translation work. (1) Participants who were above 18 years of age. (2) People who were continuous residents in a particular village/town at least for 15 years. (3) People who were willing to participate in the study. (4) Participants with education (primary school/secondary school/high school certificate/posthigh school certificate/graduate/postgraduate degree). (1) People who refused to participate in the study. (2) People who could not comprehend the questions of the study despite the assistance. Initially a trial test was conducted on sixty participants.A questionnaire was provided to the participants to ensure that they understood the questions clearly. The participants were requested to fill and return the questionnaire then and there itself to avoid bias. Feedback from these participants was considered, and those questions which were incomprehensive were reframed to suit the comprehension level of survey participants and improve the clarity of meaning. Participants' ages were classified as 20–35, 36–50, and >50 years. Education was classified as primary school, secondary school, high school certificate, posthigh school certificate, or graduate/postgraduate degree. The field work for study was conducted during morning hours and lasted for a period of 3 months. The identity of the persons participating in the study was kept anonymous. Data were analyzed using SPSS version 15.0 (SPSS, Chicago, IL, USA). Chi-square test was utilized to find the significant difference between the responses. One-way analysis of variance was used for comparing the knowledge between different subgroups. For all the tests, P ≤ 0.05 was used for statistical significance. A descriptive cross-sectional survey using a self-designed questionnaire incorporating 23 questions about various common beliefs about oral health, diseases, and treatment was conducted in a sample of 500 rural residents from 10 villages and 500 residents of Sangamner city. They were selected by simple random sampling technique. The data so collected from the participants were systematically compiled, and multiple tables were generated. The majority of respondents were male (54.5%), and the major age group under study was between 36 and 50 years (43.2%) as shown in [Table 1]. Around 57.1% of study population had at least high school level of education as shown in [Table 2] and 23.9% were uneducated. [Table 3] shows descriptive about beliefs regarding dental treatment and oral health. The results show that a taboo regarding removal of the upper teeth affects vision was found in 92% of uneducated participants and 87% of the educated participants. About 63% of uneducated participants regarded dental treatment to be harmful during pregnancy as compared to 45% of educated participants. Nearly 45% of participants believed in discoloration of the teeth caused by eating brinjal as compared to 23% educated participants. Almost 65% of uneducated participants regarded treatment of milk teeth unnecessary and considered endodontic treatment of milk teeth harmful for the developing permanent tooth (77%). There was not much difference in opinion regarding the strength of teeth related with tooth color. Majority of the population under study did not believe in dental checkup in the absence of any dental problem. Oral cancer was believed to be related to the past sins or result of God's punishment by 87% of uneducated participants. A rural area in India may present a different picture from an urban one, just as Indian dental concepts and practices may vary from European ones. Unfortunately, little such epidemiological data is available for India where village communities still comprise more than two-thirds of the country. The present study was carried out with the aim of collecting data on about beliefs regarding dental treatment and oral health. In the present study, regardless of cultural beliefs, highly educated urban youths were significantly interested in taking preventive dental actions. The belief that extraction of the upper teeth deleteriously affects eyesight was shared by 87% of educated and 92% of uneducated participants. Earlier lack of oral hygiene resulted in loss of the teeth due to periodontal problems around age of 40 years. This was also the time for of the eyesight to become weak, hence the relation. When brinjals are cut they turn black. 45% of uneducated people believed that staining of the teeth is because of eating brinjal. This is not true. It was found that almost half of the study participants believe that there is no need to go to dentist until all the permanent teeth of child erupts. They think that these teeth are going to shed, so consider their treatment as waste of money and time. It was found that overall 68% were uneducated and 44% of the respondents thought that after oral prophylaxis teeth will loosen, which may be attributed to the fact that many people from rural areas have little knowledge about dental treatments. They tend to visit the dentist at advanced stages of disease, and at that time, if a dentist removes calculus, it may be likely that the tooth will become more mobile. This loosening could lead the patient to consider the dentist as the culprit. Diseases of oral cavity such as cancer are considered to be a result of wrath of Gods and Goddesses, and administration of drugs is still considered harmful for treatment. Use of tobacco, cloves for easing toothache, and charcoal, alum, etc., for cleaning teeth may be attributed to the fact that the products such as clove are easily available and relieve pain quickly, and cleaning materials such as charcoal are cost-effective which are mostly used in developing countries like India. Spacing between teeth and the presence of extra tooth is an indication for good destiny and wealthy future. It is one of the cultural beliefs that are transmitted from one generation to another through learning processes, formal and informal. Beliefs are usually passed on from one generation to the next. It is deep seated in the society and has harmful effects on the oral tissues and hence has to be discouraged. Dental professionals, primary health workers, and school teachers together can a play a vital role in creating the awareness and to remove the misconceptions that hinder an individual from seeking dental services. The misconceptions which abound among the general public about dentistry need to be cleared up. These wrong ideas prevent patients from seeking timely treatment, thereby complicating simple dental problems. Therefore, creating awareness regarding beliefs about oral health and treatment should be considered for future interventions. Census of India 2001: Data from the 2001 Census, including cities, villages and towns (Provisional). Census Commission of India. Archived from the original; 2004. Available from: http://www.censusindia.net/results/town.php?stad=A&state5=999. [Last retrieved on 2008 Nov 01]. Mohire NC, Yadav AV, Gaikwad VK. Current status of oral hygiene: A clinical survey report. Res J Pharm Tech 2009;2:274-82. Park K. Park's Textbook of Preventive and Social Medicine. 17th ed. Jabalpur, Madhya Pradesh; Banarsidas Bhanot Publishers; 2002. p. 440-512. World Health Organization. WHO Chronicle 3; 1976. p. 337-9. Available from: http://www.apps.who.int/iris/bitstream/10665/86029/1/Official_record233_eng.pdf. [Last accessed on 2017 Apr 04]. Chandra Shekar BR, Raja Babu P. Cultural factors in health and oral health. Indian J Dent Adv 2009;1:24-30. Dandrad RG. The cultural part of cognition. Cogn Sci 1981;5:179-95.